If your partner is quite non-traditional when it comes to jewelry or you simply want to buy her a unique and special engagement ring, there are plenty of options out there that you can choose from. From colorful diamond alternatives to unique, custom-made engagement rings, there is a large range of options that you could go for to make sure that she feels as special and loved as possible when it’s time to pop the question. While a simple solitaire diamond engagement ring may be a popular traditional choice, if you want to be a little outside of the box, then you’ll need to consider the alternatives. Thankfully, there is plenty out there to choose from a wide range of diamond engagement rings at House of Fraser, and can even save money with House of Fraser Discounts at Voucherbin.co.uk. Diamonds may be a popular trend, however, jewelers know that not everybody is into the traditional choices. 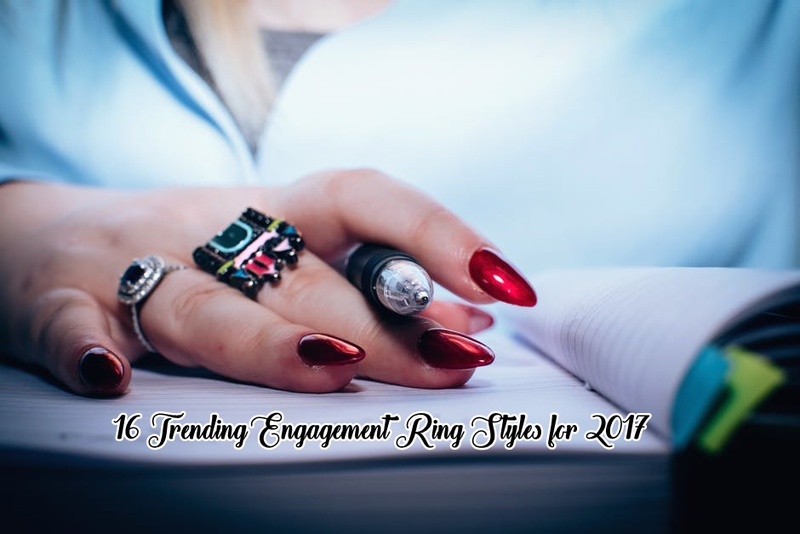 We’ve listed some of the best engagement ring trends to choose from that involve more than the traditional diamond. Rose gold is a huge trend in jewelry; it’s everywhere! From bracelets and necklaces to watches and rings, you can find all sorts of jewels in this pinkish rose hue. When it comes to engagement rings, the trend is just as popular as ever. A rose gold engagement ring can make the perfect alternative to the traditional silver, yellow gold, white gold or platinum choices. With a feminine shade that’s flattering to all skin tones, your partner is sure to love a rose gold engagement band to take pride of place on her finger. If you’d still like to get her a diamond ring but want to do something a little different from the norm, then this could be the perfect choice. Engagement rings that tell a unique story are a very popular choice today. Rather than purchasing a generic engagement ring from the jewelry store, a vintage ring will often have been passed down through generations and seen plenty of wonderful life events. Perhaps there is a vintage ring in your family; heirlooms such as these often make the perfect engagement ring since they are unique and special to your family, making them a very precious choice. If you still want to choose a traditional diamond ring but don’t want the generic option that everybody seems to be getting, a colored diamond could be a wonderful idea for an alternative. Diamonds with colorful hues are available in a huge range of shades, such as pink, yellow or even black. It’s a great option for anybody who wants to stand out from the crowd! When it comes to picking a gemstone for your engagement ring, then there’s no need to stick to diamonds alone. In fact, there are plenty of alternative gemstones out there that make perfect, stunning engagement rings. For example, sapphires and emeralds are some of the nicest choices of gemstones out there, and very popular alternative gemstones to diamonds when it comes to engagement rings. Or, you could consider stones such as rubies, which give off an instant vintage vibe whilst still providing plenty of sparkle and shine. Another great idea is to consider multi-stone engagement rings, for example, having a ruby or sapphire set between two smaller diamonds. Another idea that you might want to consider if you want to be a little different with your choice of engagement ring is a square band. Not only are square bands really sleek and elegant, they’re also a lot more comfortable to wear – with a square band, you can be sure that your partner will never suffer from the ring pinching or being too tight around her finger. If you’ve decided that a traditional diamond ring is the right choice for you, then you can change things up and go against the flow a little with your choice of cut. Whilst round-cut diamonds are by far the most popular type of center stone for an engagement ring, other shapes, such as marquise-cut and pear-shaped diamonds, are certainly making a comeback. These unusual cuts are sure to make your partner’s engagement ring stand out and get everybody talking about it for all the right reasons. Why have one band when you can have two? Whilst single bands are the traditional type of engagement ring to choose, double and multi-banded rings are quickly becoming a top trend. These fashionable designs come in a variety of different looks, and can be incorporated into a number of different engagement ring types; they look great with traditional diamonds or almost any other type of gemstone. If you can’t decide whether to go for rose gold, white gold, yellow gold or platinum when choosing an engagement ring for your partner, then why not simply go ahead and have all of them? Halo engagement rings are the best choice for doing this; a mixed metal halo can give any engagement ring a stunning upgrade. It’s not just the gemstone that you can change up to be more unique with your choice of engagement ring; you can also find a number of alternative band styles that will certainly make this piece of jewelry stand out. For example, twisted bands look very chic; these can be a stunning alternative to traditional plain bands, especially when they are adorned with tiny diamonds around the perimeter of the ring. One of the simplest ways to stand out with your choice of diamond engagement ring is to place the diamond differently. For example, oval-shaped diamonds are one of the most popular engagement ring choices to go for, however, placing it the opposite way, known as an ‘east-west’ setting, where the diamond is placed horizontally on the ring, can certainly add a unique touch to make your ring stand out from the crowd. Why not stand out from the crowd with your choice of engagement ring by adding unique embellishments to it? Bows and flowers are becoming a very popular choice of addition to an engagement ring, and can certainly add a cute, feminine touch that your partner is sure to love. Another trend that’s been taking the engagement ring world by storm is minimalism. And, the best thing about minimalistic rings is that since they tend to use smaller diamonds, you can often expect to pay less for them. One of the most popular ring styles that use this trend is pave diamond rings; they are made with a cluster of tiny diamonds around the band, meaning that although it’s not a massive rock, it will still give off a great sparkle when your partner puts it on her finger. Stackable rings are a massive trend in jewelry, and the engagement ring industry is no stranger to them. There is a wide assortment of designs that you could choose from, such as unique rings that fit together to make one, or come apart to be worn as two rings. Additionally, you can find engagement, wedding, and eternity band sets that can be stacked for a stunning look. If your partner has a colorful personality and loves to mix and match different shades when putting together her outfits, then why not choose her an engagement ring that matches? Rather than having just one gemstone or diamond, opting for a few smaller ones in different colors can be a unique look that you won’t find anywhere else. If you’re looking for a vintage-inspired engagement ring, then the Edwardian style is one of the most popular trends to choose from today. Well known for their intricate, feminine designs, an Edwardian engagement ring is sure to wow your partner when you get down on your bended knee and present it to her whilst asking her to be your wife. With stunning details, Edwardian engagement rings can be pre-bought at jewelry stores or custom-made to create a unique design. If you have browsed through all the suitable engagement rings and still can’t find one that you think is the perfect fit for your partner, then you might want to consider having a custom engagement ring made. This is the perfect way to create an engagement ring that’s perfectly suited and unique to the two of you. When you design your own custom engagement ring, you can be in charge of every little detail, from the color, shape, style and size of the band to the number of gemstones used, colors, and other intricate details. Proposing to your partner is a momentous occasion, and getting the ring right is absolutely essential! But, when it comes to choosing the perfect engagement ring, there’s so much more than the traditional diamond to choose from. Whether you’re looking for a unique twist on a diamond ring or want a stand-out, unique design that can’t be found anywhere else, there are plenty of stunning engagement ring trends to choose from.